Directly support the Funding of Lifelong Learners & Teachers™ through grants by becoming a Friend of PTFINC™. Your sponsorship as a Friend of PTFINC™ is greatly appreciated and paramount for our 501(c)(3) efforts. We invite local & national organizations and businesses throughout the United States to register as Friends of PTFINC™ today! As a Friend of PTFINC™ and partner in our efforts to support Pre-K through 12th Grade students & teachers, your organization or business will be prominently displayed throughout Private Tutor Foundation's website with a Friend of PTFINC™ Sponsor Badge. Your Sponsor Badge is an effective way to show your support of our 501(c)(3) efforts while communicating your company's message in the written word, including a short title and tagline, your location, telephone number and link to your website. 100% of all Friend of PTFINC™ donations directly support the 501(c)(3) efforts of Private Tutor Foundation, Inc.
Register as a Friend of PTFINC™ to Sponsor our 501(c)(3) efforts with the Funding Lifelong Learners & Teachers™ through grants. Where will my badge be shown? Your Friend of PTFINC™ Sponsor Badge is displayed throughout Private Tutor Foundation™ in both page footer and sidebar displays. When your badge is selected for display on a page, it will be shown in a group of 4 along the bottom edge of the page content, or in a group of 4 stacked vertically in the right hand sidebar. 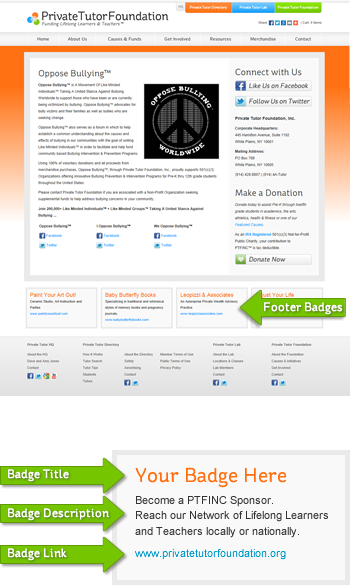 This layout includes your badge title, description and URL. Guests who click your badge will open your website in a new browser window. What will my badge look like? All Friend of PTFINC™ Sponsor Badges contain 3 lines of text content. The description (max 100 characters) is your opportunity to introduce your business, or a specific service or offer. The link (website URL) appears beneath the badge description. It is best to use your domain name only as the link name, however the URL that it links to can be that of a landing page specific to your offer. Your badge link might look like 'www.yourwebsite.com' but link to 'http://www.yourwebsite.com/your-landing-page.html'. There are 3 levels of PTFINC™ Sponsorship. 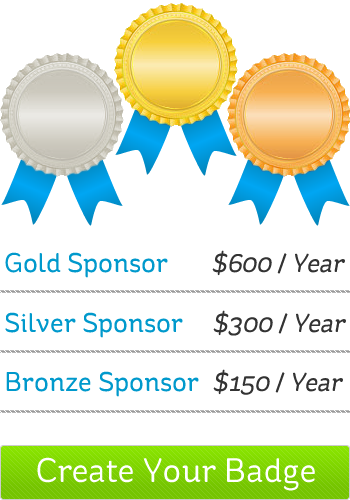 Earn a Gold, Silver or Bronze Sponsor Badge based on your contribution. Donate $600 to help with the Funding of Lifelong Learners & Teachers™ through our 501(c)(3) efforts and earn our Gold Sponsor Badge to be displayed on our website with your company's information and a link to its website. Donate $300 to help with the Funding of Lifelong Learners & Teachers™ through our 501(c)(3) efforts and earn our Silver Sponsor Badge to be displayed on our website with your company's information and a link to its website. Donate $150 to help with the Funding of Lifelong Learners & Teachers™ through our 501(c)(3) efforts and earn our Bronze Sponsor Badge to be displayed on our website with your company's information and a link to its website.